2. In a food processor combine oats, flour, cinnamon and brown sugar and give a few good chops until oats are ground. 3. In a bowl combine butter and add mixture from the food processor and mix until dough is crumbly. 4. Butter the bottom of a pie plate and press the dough to the bottom and sides. Place pan in the oven and bake 15 minutes or until crust is slightly golden. 5. For the filling beat together eggs, ¼ cup sugar and vanilla. Beat in the milk until smooth. 6. Arrange the apple wedges on the bottom of the crust and pour the filling into the crust. Sprinkle the combined topping on the pie and return to the oven for another 30-40 minutes, or until the filling is set. 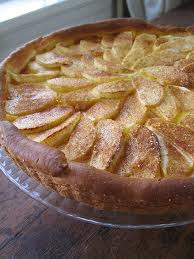 The egg custard pie recipe of apple with oatmeal crust is ready to serve...Enjoy the pie !